We have posted on the danger of this asinine strategy of saying the Iranians are hiding behind every bush. The relentless talking about the 'foreign fighters' who are the big reason we are losing in Iraq, when the foreign fighters are less than 5% of the insurgents. I want to look at the McClatchy story currently out about the inside job attack in Karbala that killed 8 paratroopers of the 173rd Airborne from Alaska. The story outlines in chilling detail the details of the attack. Titled Death By Treachery, McClatchy intends to dribble out a little at a time over the next couple days. At a briefing two weeks ago in Baghdad, a military spokesman disclosed new suspicions of high-level Iranian involvement in the attack, including the alleged use of Lebanese proxies to train the force. But while U.S. officials speak about the Iranian role in planning the attack, they have said little about how Iranians obtained the detailed intelligence needed for the raid or who carried it off. Thats the point, if you read the article it describes an operation that was well scripted and clearly knew the terrain, culture, and neighborhoods intimately. These were Iraqi's. 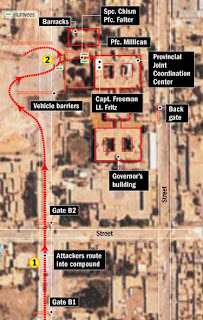 An official Army investigation, completed in February and recently released to the Daily News under the Freedom of Information Act, also suggested Iranian involvement in the attack. The guys who executed this plan, and paratroopers who sat at their desks, were not from Iran. They came from down the road and are probably still sitting there washing and waxing those SUV's while the U.S. is running around arresting Iranians in their 'Torture and Release' program. When you run around talking about Foreign Fighters this and Foreign Fighters that you leave some PFC standing at a guard post not realizing that his biggest threat is the Iraqi policeman who just opened up the back gate and walked away.